Lots of great info, but so much was left on the cutting room floor! Keep reading to get an exclusive behind-the-scenes look at the full interview with Dr. Yoo. R&C: "We all want to look younger, or the best we can. What are some of the top trends in cosmetic procedures?" Dr. Yoo: "Neuromodulators (i.e. Botox, Xeomin) and fillers (i.e. Juvéderm, Belotero) continue to be very popular and in high demand. The most popular new product at SKY has been Juvéderm Volbella XC, which can be used to treat lines around the mouth as well as plump the lips. Most long lasting fillers are thicker, making them less ideal for use in the lips. The great thing about Volbella is that it’s as silky and smooth as the shorter acting fillers, but lasts twice as long." R&C: "What's the one procedure every patient should get?" Dr. Yoo: "Aging is multi-factorial and no single modality addresses every aspect. Neuromodulators, fillers, and laser procedures continue to play important roles in maintaining a more youthful appearance. As we age, we lose volume (fat, muscle and later bone) in our faces. Fillers help to restore this lost volume. We also experience dermal and skin changes. Neuromodulators relax wrinkles that are caused by muscle contraction. Laser procedures address skin texture and coloration. For skin laxity and structural changes, surgery continues to be the answer." R&C: "What are some of your most requested procedures?" Dr. Yoo: "Facelift, rhinoplasty (nose surgery), blepharoplasty (eyelid surgery), laser procedures, neuromodulators, and fillers." R&C: "Is plastic surgery, in general, becoming less popular, facelifts in particular? We've all seen older women and celebrities with obvious facelifts—skin pulled too tightly, for instance. How can that be prevented?" Dr. Yoo: "Facelift surgery is possibly more popular than ever. Attitudes toward plastic surgery have drastically changed. There is much greater acceptance among the general population. A facelift addresses laxity of the lower face and neck. Currently, there are no great alternatives. Fillers restore volume, but do not provide much lift in the lower face without looking “over-done.” Understanding of facial anatomy and surgical techniques have improved and modern techniques allow talented surgeons to tailor a facelift to an individual patient’s needs. A well-performed facelift should be very natural looking and not something that patients have to be self-conscious about. The goal is to keep the patient looking like themselves, but with the clock pushed back 10-15 years. Modern facelifts do no pull the skin at all. They lift the fibromuscular layers that support the skin. Another very important detail is releasing areas where the skin is firmly held in place. If these ligamentous attachments are not released, a lift will either be very limited or lead to un-natural contours and a stretched look." R&C: "What is the normal downtime for facelifts?" 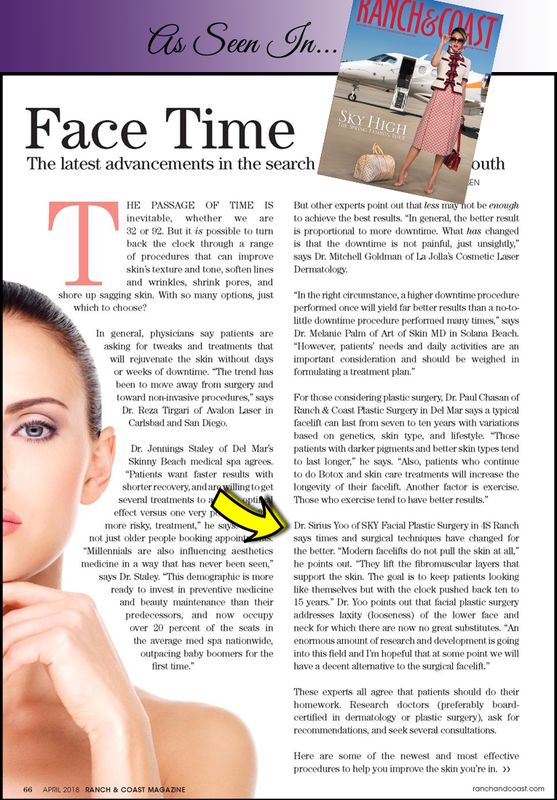 Dr. Yoo: "Downtime varies depending on the kind of facelift that a person needs, but in general patients can return to work or social engagements after two to four weeks." R&C: "Can patients have more than one facelift and still have a good result? How long do facelifts 'last'?" Dr. Yoo: "A facelift in general will set the clock back on the lower face and neck 10-15 years and then the patient will age naturally from there. It does not stop the clock. I frequently have patients come to me who had a facelift 10-15 years ago and feel ready for a second facelift. As long as the first one was performed well, the second surgery is affected very little by the first. I generally employ distinctive techniques for my second facelift patients that allow me to avoid scar tissue that may have been left behind from their first surgery." R&C: "What procedures complement facelifts?" Since the parts of our face generally age in unison, it is very common to address the eyes (blepharoplasty) and skin (laser resurfacing) at the same time. Volume replacement with filler or fat transfer is also very common. R&C: "Are there any good non-surgical alternatives to facelifts?" Dr. Yoo: "There continues to be a huge demand for minimally invasive or non-invasive skin tightening procedures for the lower face and neck. A number of new modalities have emerged on the market, such as Kybella, CoolSculpt and Thermage, just to name a few, but so far the results that can be gained through non-surgical procedures are subtle at best and do not come close to providing the type of results one would see from a facelift. As with anything, there are tradeoffs. Minimally invasive procedures have less downtime, but less impressive results than surgery. They also generally require regular treatments or a series of treatments, whereas surgery happens once and provides results that are more permanent. An enormous amount of research and development is going into this field and I’m hopeful that at some point we will have a decent alternative to the surgical facelift. We are not there yet." R&C: "If a patient is considering procedures, how should he or she begin the process?" Dr. Yoo: "How someone should approach the process is very personal and largely depends on their personality. If someone doesn’t mind being open about their intentions, asking others who may have been through the process about their experience can be very informative and empowering. Family and friends who have been through the process can be a trusted source of information. A person’s primary care doctor or esthetician may be able to give them a reliable referral as well. The internet can be a tremendous source of information. Unfortunately, it can be very overwhelming as well. There is just so much information (much of which is not true) about plastic surgery out there and sifting through it all can be a Herculean task. I usually recommend that someone do their research to find a few surgeons who specialize and have training in the area for which they are having surgery. For example, there are two board certifications that focus on the head and neck: facial plastic surgery and otolaryngology. There are also fellowships that provide additional academic training in specific areas of the body. From there, schedule consultations to learn more about the options that are available to address their concerns and to meet the surgeon. It’s very important that they feel comfortable with the surgeon and the staff as well as the proposed plan prior to moving forward." R&C: "What is the best time to have certain procedures?" Dr. Yoo: "The best time is usually whenever it fits in with the patient’s lifestyle. I find that most patients have an upcoming milestone that is motivating them, such as a wedding, graduation, or reunion. From there, the downtime of the recommended procedure needs to be taken into account (how long the healing process will take before they see the final results). Also, many patients schedule surgery around their work schedule as most require one to two weeks off of work. I believe the best time is when it is bothering someone enough to want to do something about it and they are mentally ready. Most surgery can be done early or late, but doing it earlier lets one enjoy the results longer."